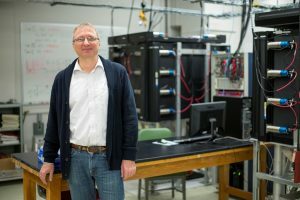 TUSCALOOSA, Ala. — Dr. Andreas Piepke, a professor in The University of Alabama’s department of physics and astronomy, was recently elected as a Fellow of the American Physical Society for his work in defining the nature of neutrinos, neutral subatomic particles and fundamental constituents of matter. Each year, only 0.5 percent of the 53,000 members of APS, roughly 265 people, can potentially be elected a Fellow. “It’s a big honor and a welcome recognition for work done in the field,” Piepke said. To better understand neutrinos, Piepke works with neutrino detection experiments—like the one which helped him and a team of national and international physicists win the $3 million Breakthrough Prize in Fundamental Physics in 2015. More recently, this and other work led Piepke to become the only APS Fellow to work for The University of Alabama. Though neutrinos make-up three of the 12 building blocks of matter, scientists still don’t know much about them. Dr. Giorgio Gratta, a professor of physics at Stanford University and long-time collaborator of Piepke’s, nominated Piepke to become a fellow of the APS. While Piepke continues to work on uncovering the nature of neutrinos, he is now also working to uncover the true nature of dark matter. Piepke has been a professor at UA since 2000. Fifteen University of Alabama alumni and students won Fulbright awards for 2018-19. Two UA students and alumni received Fulbright research awards. Thirteen 2018 graduates won awards as English teaching assistants overseas.